Clouds End is a lovely self catering holiday home on the Malvern Hills available for serviced business lets, family holidays and short breaks. 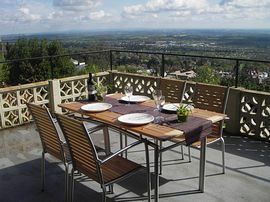 The house is a 5 minute walk to the town centre and has the most spectacular far reaching views from both the house and the extensive terrace. Clouds End self catering accommodation is exceptionally well appointed with modern furnishings, new fully appointed kitchen and bathroom with bath and power shower. On your arrival the lovely holiday home will have fresh flowers and a generous welcome tray that includes local and organic breakfast provisions and a bottle of quality wine. 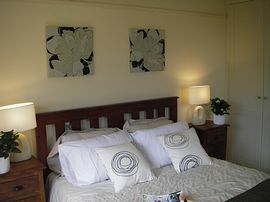 Clouds End accommodation sleeps from 2 to 7 people and is available for a minimum of 1 nights stay midweek or weekends. The views from Clouds End holiday home are outstanding and on a clear day you can see for miles and miles across the countryside. The lovely holiday home has parking for three cars on a private drive and is available for weekly lets or weekends. For stays of two weeks or more your self catering holiday home/accommodation will be serviced weekly. Fantastic Views that are quite unique due to its location. Local Services: Walking distance to the town centre with restaurants, pubs, shops, post office, tourist information and Waitrose. When you come into Great Malvern on the A449 just past where the shops begin on the top of Great Malvern keep your eye out on the right for the Unicorn pub. At this pub there is a right turn into St Anns Road. Take this road up the hill past the Red Lion Pub on your right. Follow the road at the first left which is still St Anns Road. You will pass some houses and a new development of apartments. Just after these apartments (Aldwyn Tower) the road splits into 3. The top road is a walking track to St Anns Well, the bottom road is a private road to 2 houses. Continue on the middle road for about 100 metres when on your right you will see an emergency turning bay. Just next to this behind the signs St Anns Road and Foley Terrace is the driveway to Clouds End. When you go up the driveway you can park and turn all the way up to the neighbours green garage doors as they park their car just in at the left of Clouds End driveway. 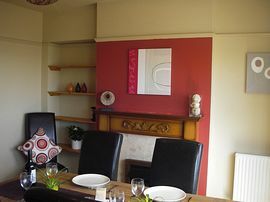 Minimum rate per night: (1 - 3 guests) £110.00. 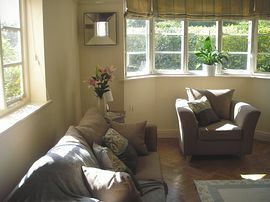 Maximum rate per night: ( 4 - 7 guests) £140.00. March 1st - 19th: £420.00. March 20th - 31st: £500.00. December 1st - December 15th: £360.00. December 15th - January 6th 2009: £820.00. Clouds End is available all year for stays of 1 night or more.